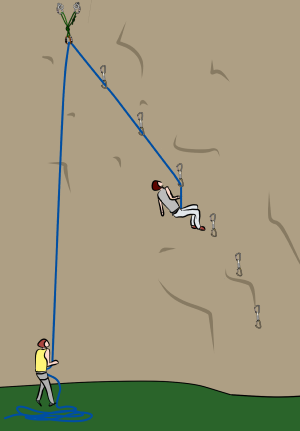 There are basically three ways to descend; walk off, lower or abseil (rappel). 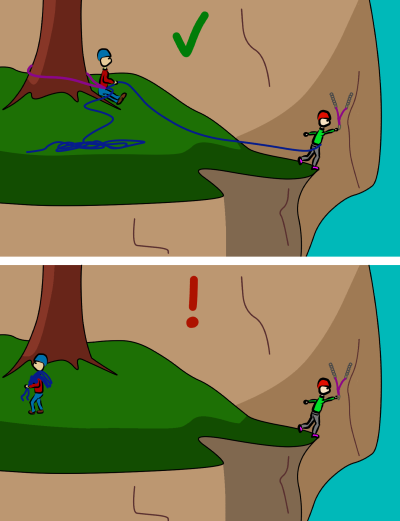 You will either lower or abseil to get down from most sport routes. When walking off is a common descent method, there will usually be an established trail back to the base. Make sure to always be securely connected while cleaning the anchor. You will often have to do a ‘mini pitch’ in order to reach safe walking terrain. If you plan to walk off, make sure to bring a couple of long slings so you can make an anchor (such as slings around a tree) for this purpose. - When the anchor is situated in such a way which means lowering or abseiling would be difficult or dangerous (e.g: far back from the top of the crag or on a ledge covered in loose blocks). Lowering is faster than abseiling. It is the most common form of descent whether you have cleaned the anchor or not. - If someone else will climb after you. - If you need to remove the quickdraws. - If you need to set ‘directionals’ on your descent. If you have cleaned the anchor, but your quickdraws are still in the route, you’ll need to retrieve them on your way down. This is easy on a straight-lined, vertical route. Simply lower down and unclip them from the bolt and the rope. 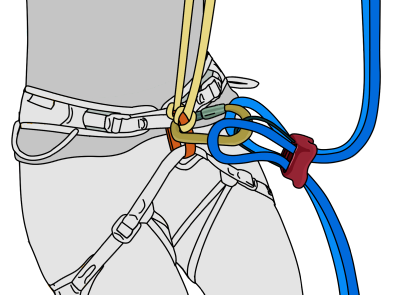 The belayer will need to stop lowering you at each bolt so you have time to do this. 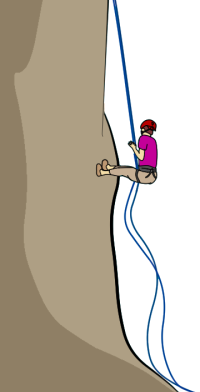 On overhanging or traversing routes it can be more difficult. 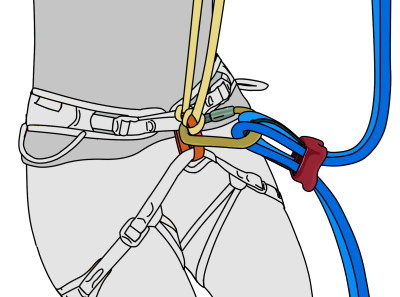 To make it easier, clip one end of a quickdraw to your belay loop and the other end to the rope. This ‘lowering quickdraw’ keeps you in the same line as the route while you descend. 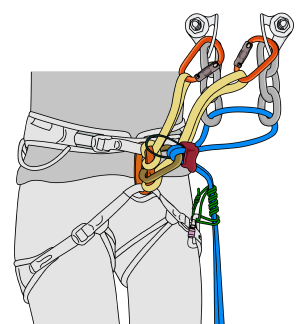 On your descent, unclip the lead quickdraws from the rope and then from the bolts. Be careful when removing the last quickdraw. 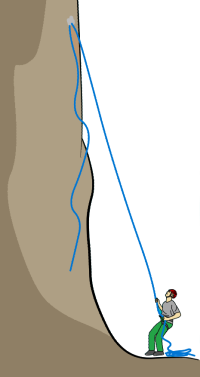 If you remove it in the same way as the others, you’ll swing out from the rock and pull your belayer with you. 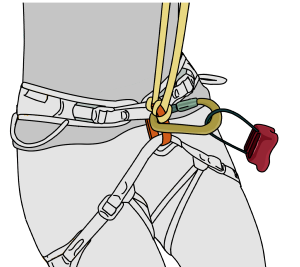 If it is a safe swing (i.e: you wouldn’t hit anything or anyone) unclip your lowering quickdraw from the rope and attach it directly to the bolt. Then allow your weight to hang on this quickdraw. Remove the other quickdraw from the bolt and the rope. Give your belayer time to take in the extra slack which is created. Next, remove the last quickdraw from the bolt. To make this easier, use holds on the rock to pull yourself in. Be ready to swing out! If it isn’t a safe swing, one option is to lower to the ground, and then ‘boulder’ up to retrieve it. This works best if you have a bouldering pad and the first bolt isn’t very high. Another option is for the belayer to be anchored to the ground. In this case, you can keep your lowering quickdraw attached until you’re on the ground. 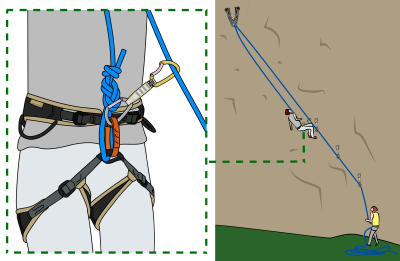 If you have top roped an overhanging or traversing route, and someone else wants to top rope after you, you’ll need to clip the rope to some of the quickdraws on your way down as ‘directionals’. These directionals stop the next climber from swinging wildly across the rock if they fall. 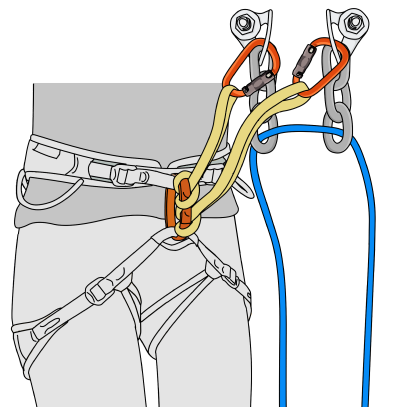 Simply clip your rope into the quickdraws as you lower. Depending on the route, you may need to clip them all, or just a couple. When you're pulling a lead rope down, shout 'rope' before it falls. This is so that everyone around you is expecting it – a falling rope in the head hurts! Make sure to pull the rope through so that the falling end drops down through the clipped quickdraws (if you are leaving them in). This will slow it down and make it safer. 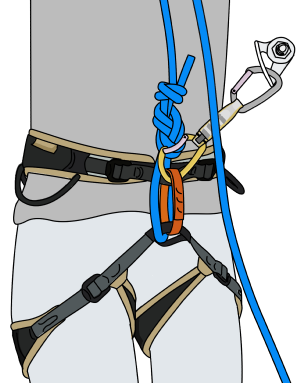 The following description is for abseiling on a single rope where the descent is less than half of your rope’s length. For longer abseils, you’ll need two ropes. 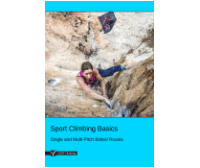 Learn more about abseiling. - If the lowering rings are already showing signs of wear (Abseiling puts much less wear on the rings than lowering). 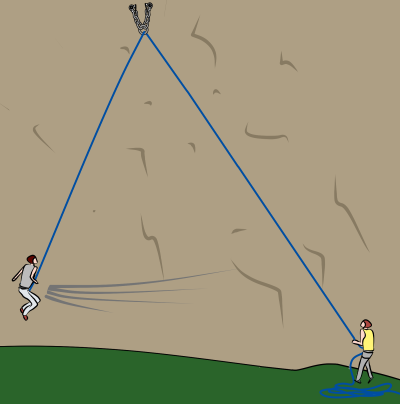 Attach yourself to the anchor and feed the rope through the main abseil point, as shown. It will be heavy, so step on it to create slack so it’s easier to clip in. 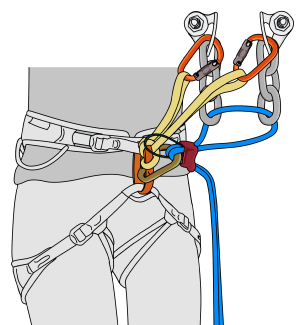 Holding the ropes in the lock-off position, sit back and apply your weight to the belay device. This allows you to easily check the setup. For most abseils, it's wise to backup with a prusik knot. 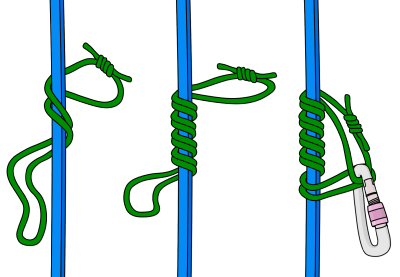 A correctly tied prusik will auto-lock if you let go of the ropes. Wrap the prusik around both ropes a few times and then clip the ends together with a screwgate carabiner. More wraps will create more friction around the ropes, though four wraps are generally enough. Pull the knot tight, make sure it is neat and the double fisherman’s knot is away from the ropes. 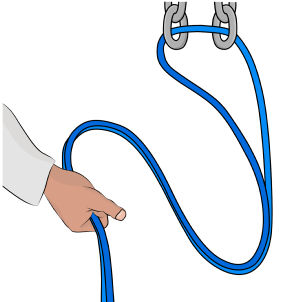 With one hand holding both ropes in the lock-off position, unclip your slings from the anchor. You can clip them out of the way on the back of your harness. Continue feeding rope through as you lower yourself down. It takes a little practise, but you'll soon be able to figure out how fast to feed the rope while staying in control. Keep going until you've reached the ground. Unfasten any knots from the ends of the rope and pull down on one side. Keep an eye on the other end of the rope as you do this to make sure it doesn't go up with a mysterious auto-knot fastened in it. - Look out for ledges, trees, chimneys or anything you might abseil into on your descent. 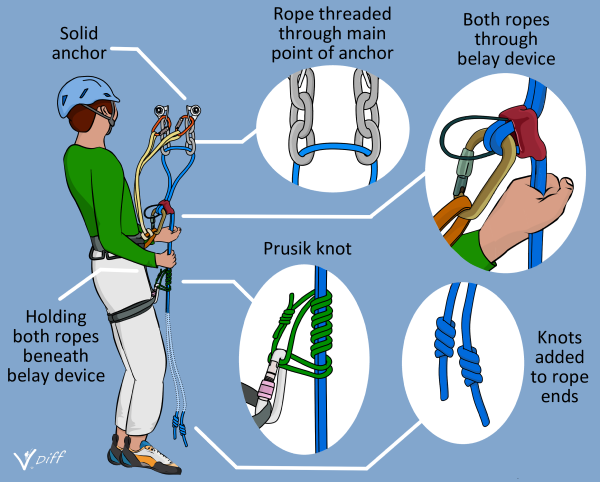 - If your rope is stuck, stop just above it and allow your prusik knot to tighten. Make sure to keep hold of the ropes with one hand while you untangle them. - Be aware of where your rope is (above and below you). Make sure it isn't rubbing over loose rock or sharp edges. 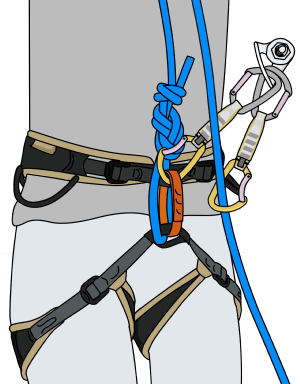 - You can only abseil half of the total length of rope that you have, so keep this in mind before climbing up. - Be aware of rocks which may get dislodged when you pull your ropes down.